The Rotary Club of Jinja, District 9200, is active in promoting projects at the School, as they follow the Rotary International’s ideal of promoting literacy to the less fortunate members of our society. By 2006 Rotary International has played a large role in the provision of educational and supportive items through the Rotary Foundation’s Matching Grants program. The Rotary Club of Jinja in conjunction with other Rotary Clubs, has been able to provide grants for the provision of various educational equipment. Several Rotary Clubs in District 5340 (Southern California) have done Matching Grant projects to provide text books and scientific equipment with the aim of increasing the literacy of the benefiting students. Another Rotary Club in District 5340 has provided funding for a bore hole to provide clean water throughout the College at an economic rate. The founder, John Kirkwood, is a Rotarian with the Rotary Club of Jinja, President of his club during Rotary’s Centennial Year (July 2004 – June 2005). Peter Kalibbala, the Tofta Trust Field Officer is a Rotarian of over 2 years, and is active in the Club. Several members of staff are also Rotarians, and are encouraging other staff members to participate in the Rotary Family. Rotary visitors to the Lords Meade Vocational College include the late Past R.I. Director Dr. Gary Romp in May 2002. Past District Governors for District 9200 Henry Kyemba and Nelson Kawalya accompanied them on his visit. In November 2002 Rotary Foundation Zone Co-ordinator Dr Ben Aghazu of Nigeria visited the College. Past District Governor District 9200, Dr Varinder Sur has also visited the College, as has Past District Governor Amir Somji in September 2003. In 2005 District Governor Abdulhamid Aboo also visited the College. Currently one member of the Tofta Educational Trust staff is active in the Rotaract Club of Jinja (for youth of 18 – 30 years). Jack Ocholla, who has special responsibilities for the students from Kenya joined the Rotaract Club of Jinja in 2002. Jack is keen not only in carrying out the Rotaract activities but also in encouraging some staff members to join. The architect of the Lords Meade Vocational College, Wilson Balidawa, followed Peter Kalibbala as President of the Rotaract Club of Jinja, and the quantity surveyor, Antony Mondo, followed Wilson into the Presidency, hence maintaining the strong link between the Rotary Family and the Lords Meade Vocational College. The Rotary Club of Jinja sponsored the Interact Club of Lords Meade Vocational College. (Interact Clubs are for students aged 14 – 18 years and follow the guidelines set out by Rotary International.) The Interact Club of Lords Meade Vocational College was chartered in August 2003 and over 50 students are actively involved in its projects of growing trees from seed, planting out trees on the compound, assisting some of the least able junior students whose families and guardians are unable to afford the basics like exercise books, pens and pencils, as well as both washing and bathing soap. One of the most active projects is the one where the Interactors grow vegetables for the students at the local school for the blind children. 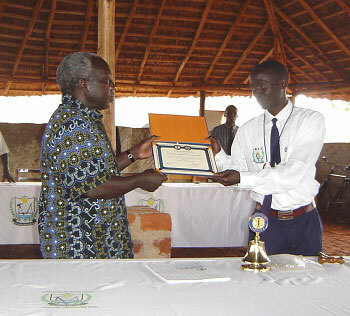 Recently the President, Charles Kyaligamba, took part in the first Youth Exchange Programme run within District 9200. 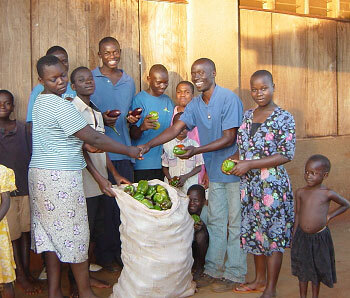 The members of the Interact Club of Lords Meade Vocational College present a sack of fresh vegetables to the students of the Annex for the Blind Students in Jinja. 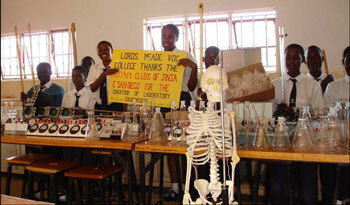 Some of the laboratory equipment kindly donated by the Rotary Clubs of San Diego, California, and Jinja, Uganda. Due to the Rotary matching grant L.M.V.C. now possesses sufficient laboratory equipment for each student to be able to carry out their own laboratory experiment – a rare occurrence in Uganda. The bore hole & 20,000 litre tank donated by the Rotary Clubs of Escondido Sunrise, Santee-Lakeside & Valley Center, District 5340, California, through the Rotary Club of Jinja and the Rotary Foundation. 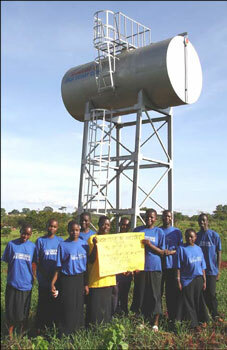 The students sign reads ‘Lords Meade Vocational College thanks the Rotary Clubs of Escondido Sunrise, Santee-Lakeside & Valley Center for the donation of a borehole. 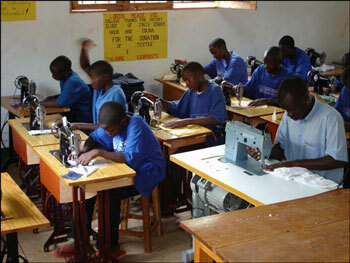 Students enjoy a tailoring class using the new treadle sewing machines kindly donated by the Rotary Clubs of Odiham & Hook, District 1140 in UK, and Colima, Mexico, District 4150 through the Rotary Club of Jinja and the Rotary Foundation. On right, the teacher tries out one of the new electric sewing machines. Right: Girls in the Home Management class enjoy preparing food with the new equipment kindly donated by the Rotary Club of Bolton Lever, District 1280, England, through the Rotary Club of Jinja and the Rotary Foundation. The donation included items like fridges, freezers, gas & electric cookers, as well as chopping boards and knives and kitchen utensils. Below: The girls entertain their teacher to the meal they have prepared using the donated equipment. Cutlery, crockery & glassware were also included in the donation. The notice reads ‘Lords Meade Vocational College thanks the Rotary Clubs of Jinja & Bolton Lever for the donation of Food & Nutrition equipment.